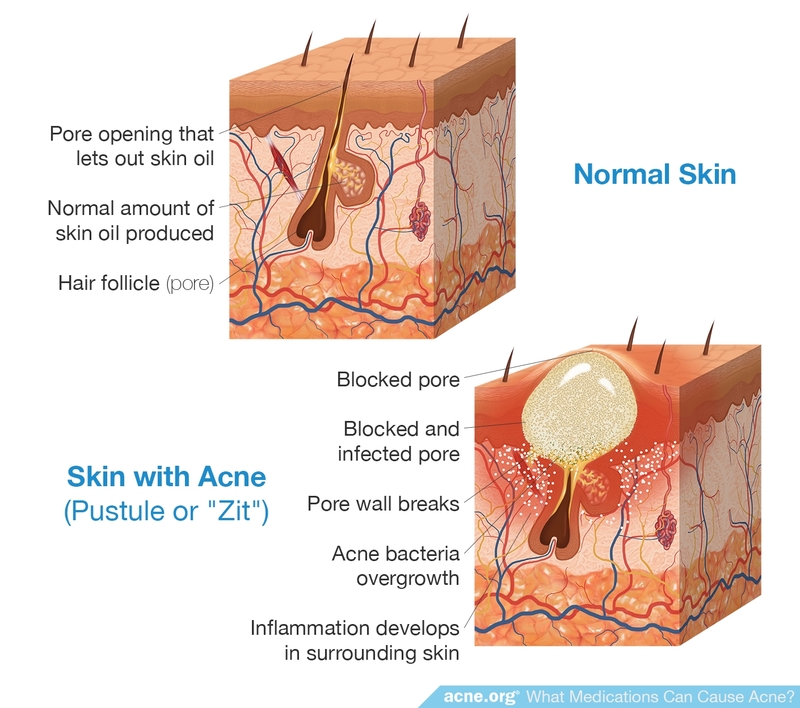 What Medications Can Cause Acne? 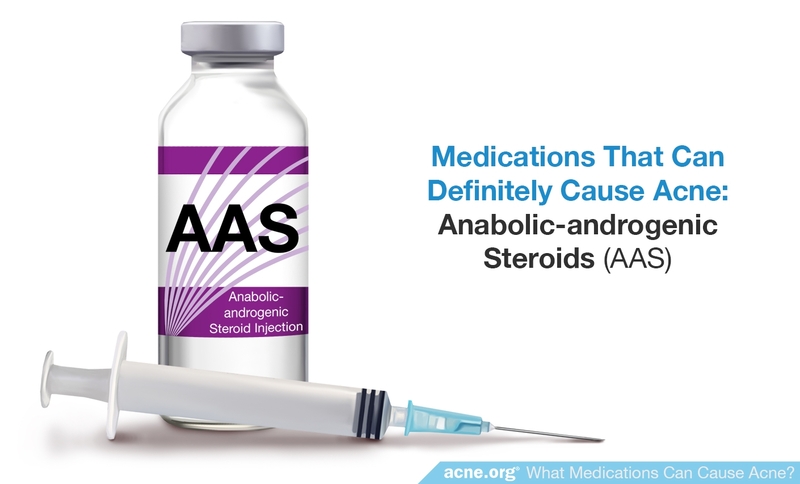 Based on research, common medications that often result in acne include corticosteroids, testosterone and other anabolic-androgenic steroids (AAS), lithium, isoniazid, halogens, and EGFR inhibitors (EGFR-I). 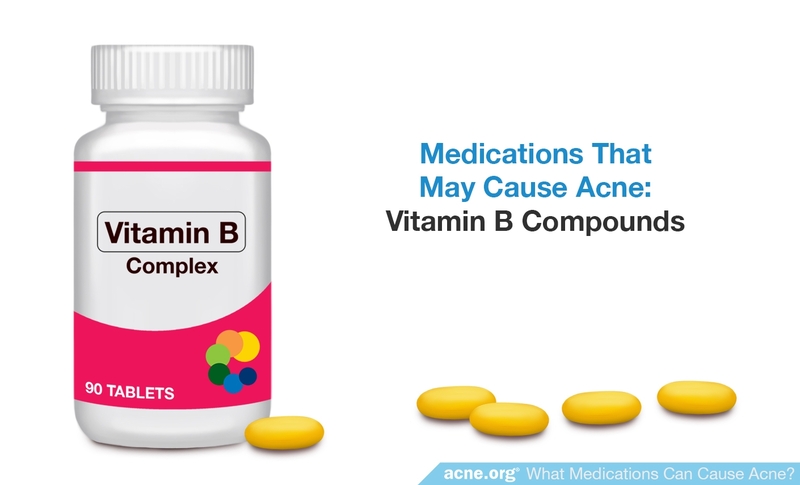 Vitamin B supplements may also cause acne, but the evidence is incomplete. 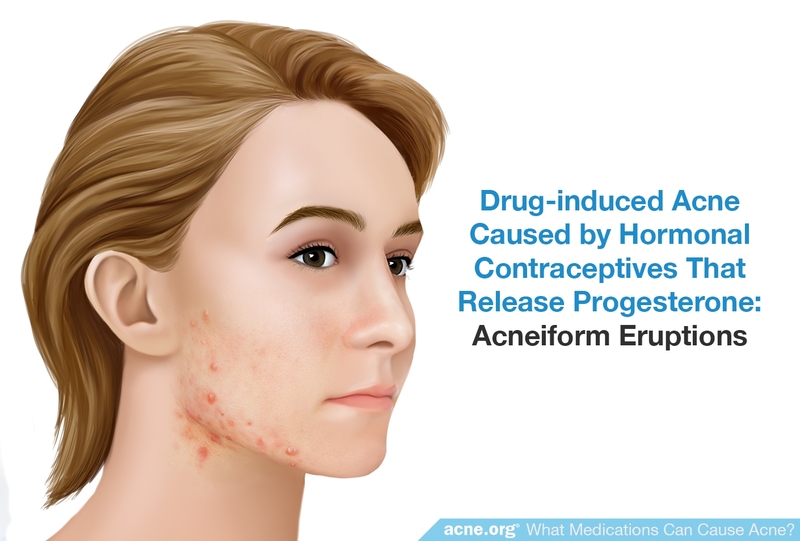 Finally, a few case reports suggest that rifampicin, ethosuximide, and some hormonal contraceptives that release progesterone might cause acne. 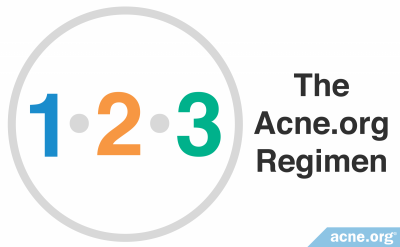 Based on the amount of research that links particular medications to acne, we can place potentially acne-causing medications into three categories. 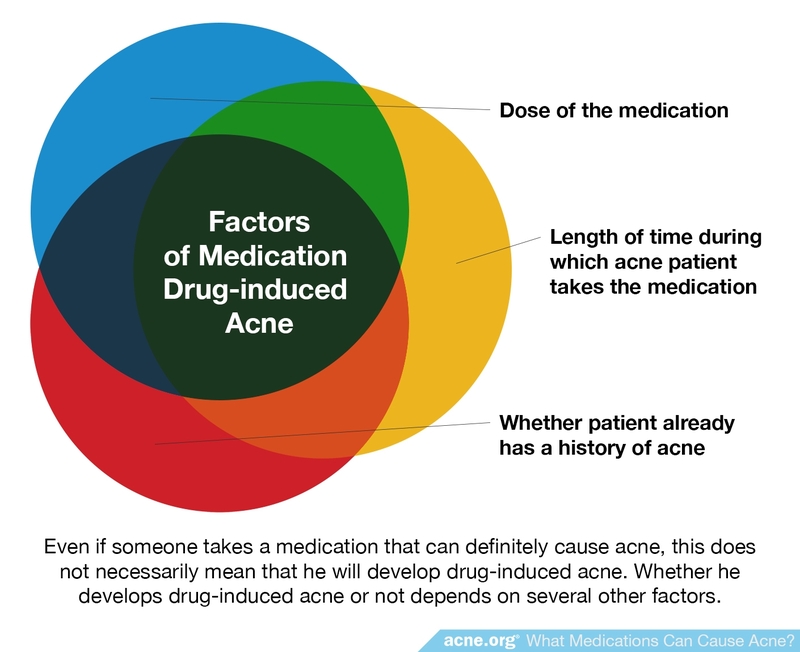 Even if someone takes a medication that falls into the first category—medications that can definitely cause acne—this does not necessarily mean that he will develop drug-induced acne. 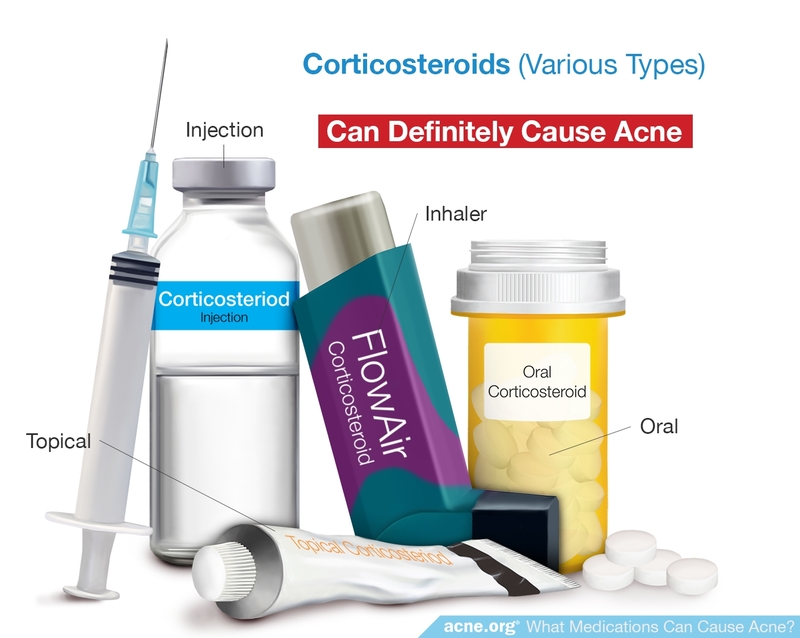 Whether he develops drug-induced acne or not depends on several other factors. 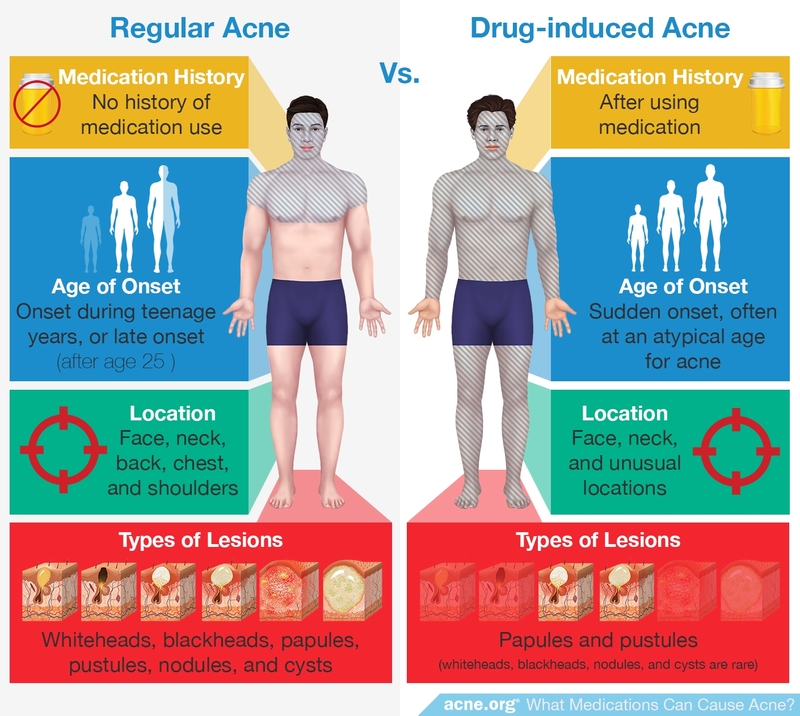 Regular acne is different from drug-induced acne (acne that is caused by medication) in four respects. Medication History. 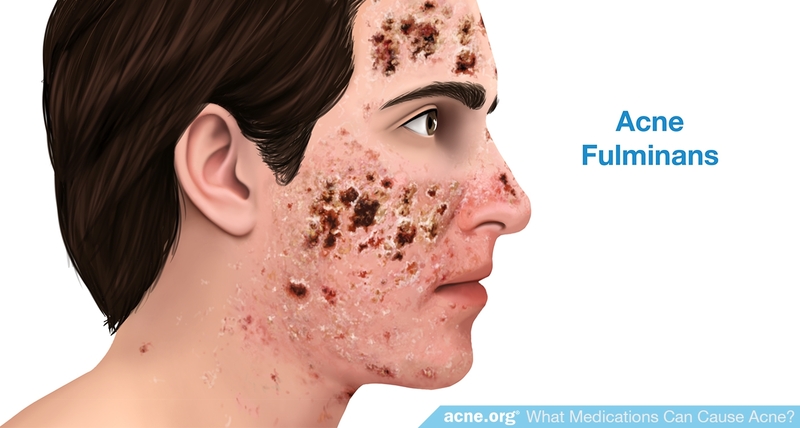 Regular acne can develop in a person who has not used any medication. 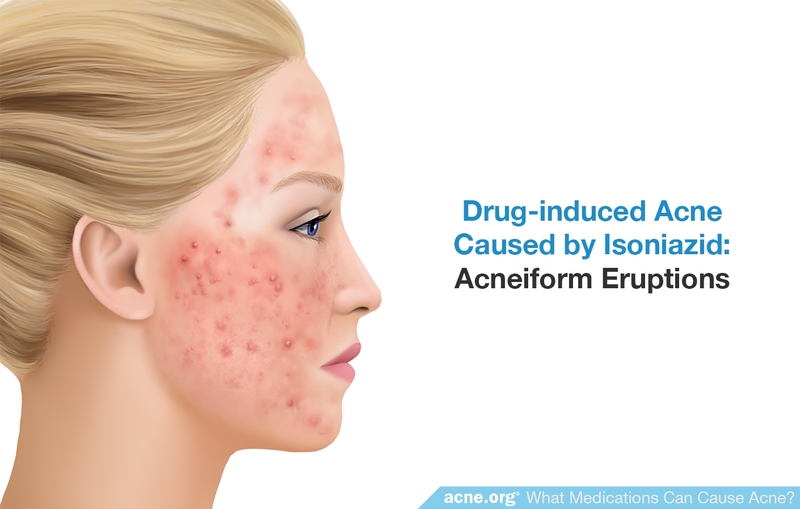 In contrast, drug-induced acne only develops after he has used a medication that can cause acne. A variety of treatments are available for regular acne. These treatments typically improve it slowly over weeks or months. 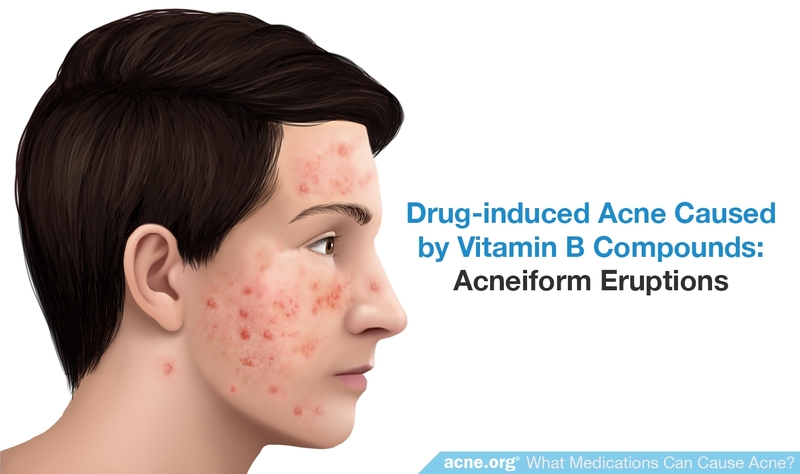 On the other hand, drug-induced acne does not respond well to regular acne treatments. It does, however, usually clear up gradually after the person stops using the offending medication. 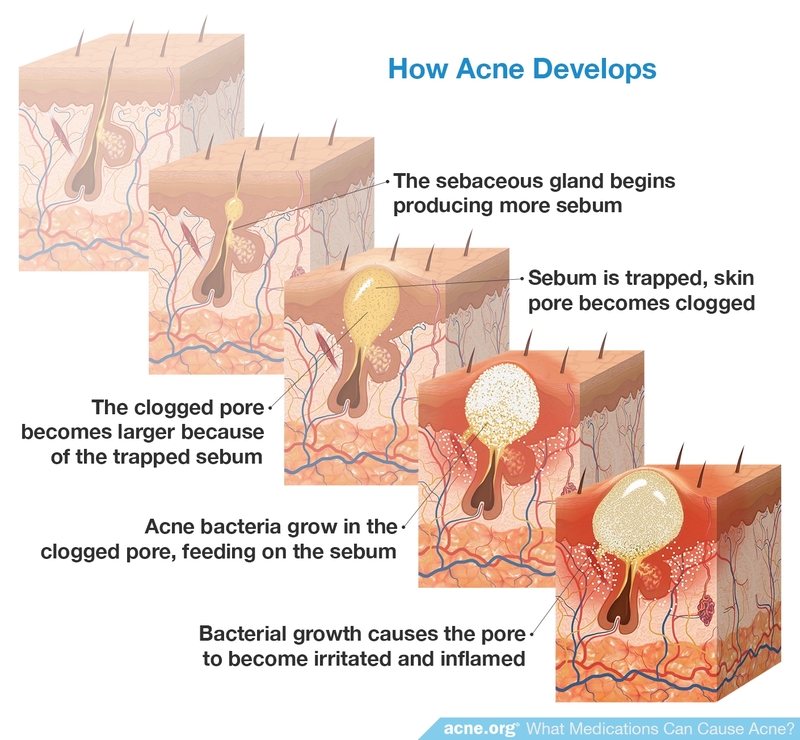 In order to understand how some medications cause acne, we need to review how acne develops. 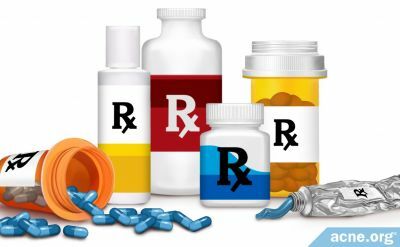 Let’s read about some common medications that have been linked with acne, beginning with the medications that can definitely cause it. 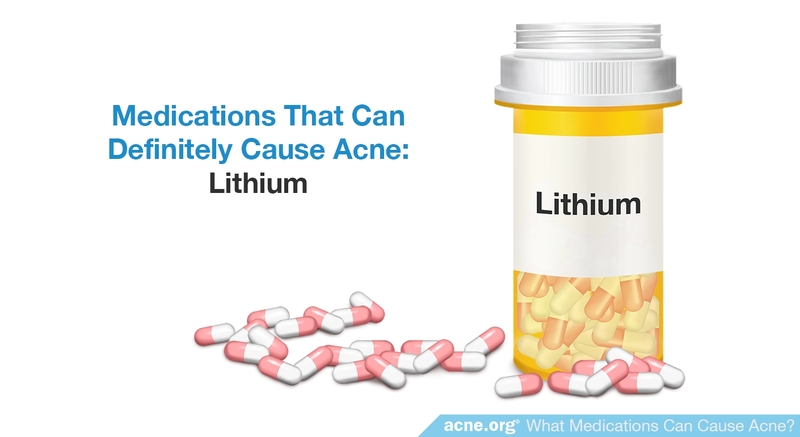 Treatment of Acne Caused by Lithium. 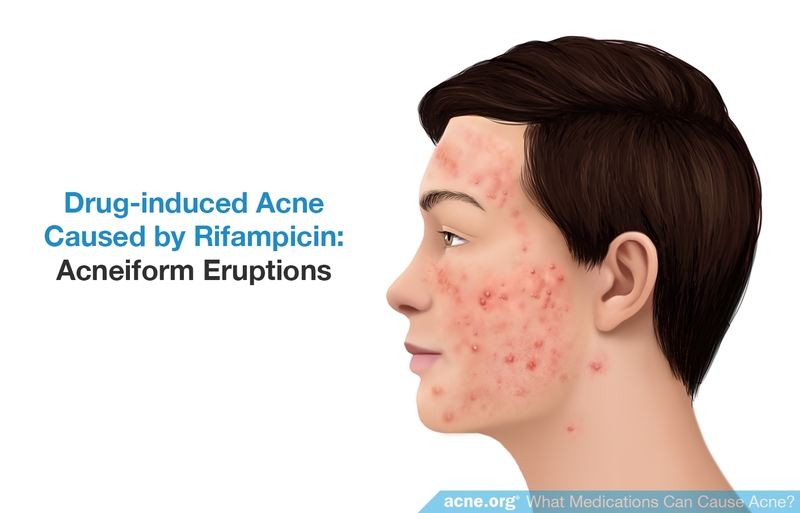 When it comes to acne due to lithium, a potential roadblock presents itself with the medication called isotretinoin (Accutane®), which is approved to treat severe cases of acne. 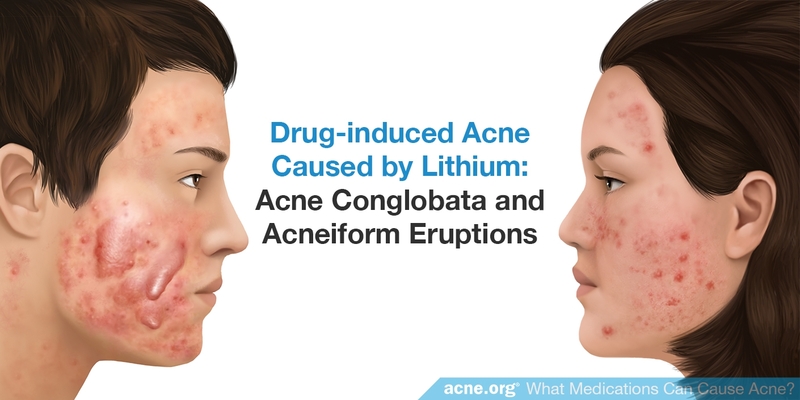 This roadblock is that about one percent of people who take isotretinoin may experience depression as a side effect, which would defeat the purpose of taking lithium in the first place.1 Therefore, if you develop acne as a result of taking lithium, your doctor may hesitate to prescribe isotretinoin to you. What It Is. Isoniazid is one of the main medications for the treatment of tuberculosis (a bacterial disease that affects the lungs). 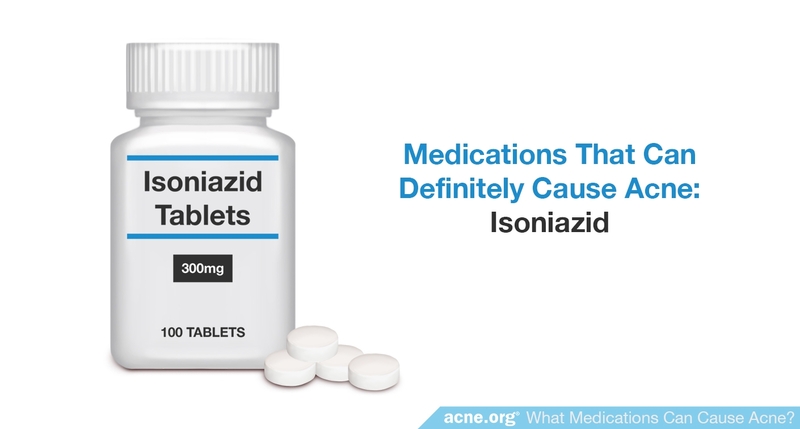 According to two large studies, approximately 1.4–2.5% of people who take isoniazid develop acne—usually after taking the drug over a long period of time2—and taking it with other tuberculosis drugs may increase your chances. 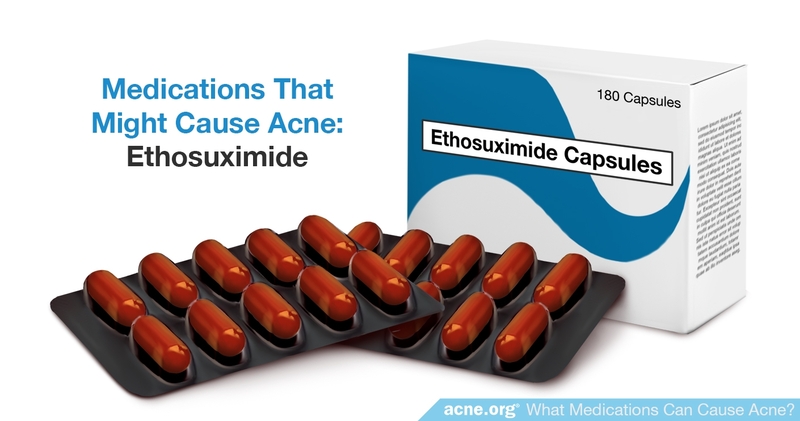 How They Cause Acne. We currently do not know how halogens cause acne. 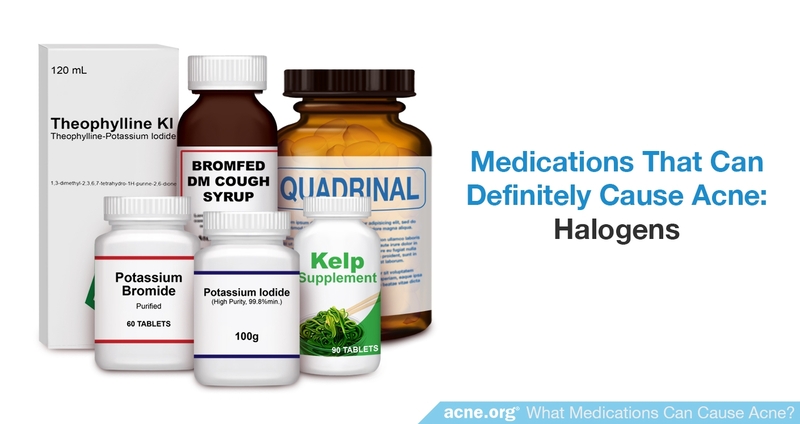 Treatment of Acne Caused by Halogens. 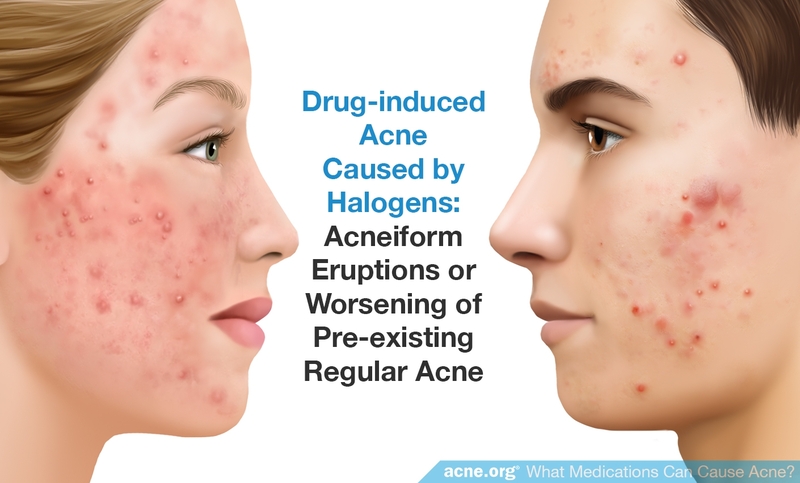 Once a person stops using medications containing halogens, his acne should gradually disappear. 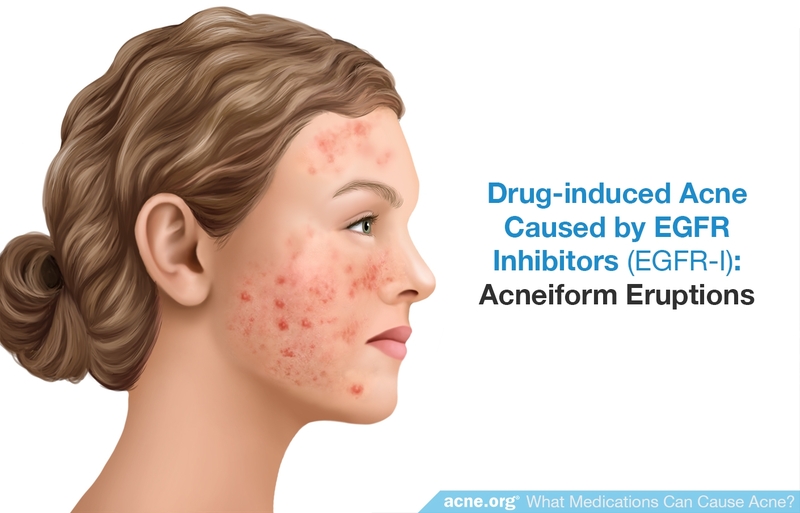 Treatment of Acne Caused by EGFR-I. 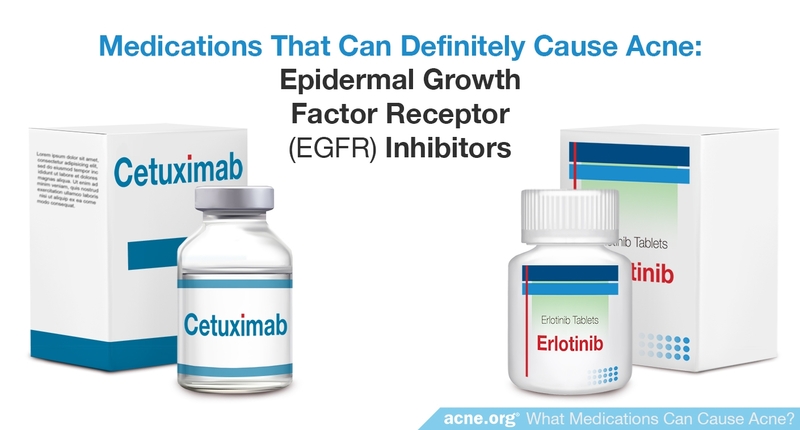 Acne caused by EGFR-I, just like regular acne, can be treated with a variety of therapies. Treatment, however, is nonspecific. 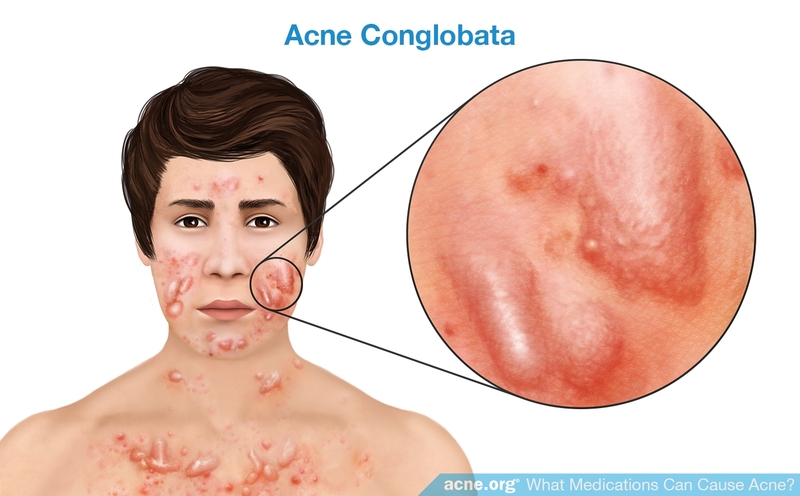 The lesions are known to respond to the regimens used in the standard treatment of acne, including commonly used anti-acne medications8. 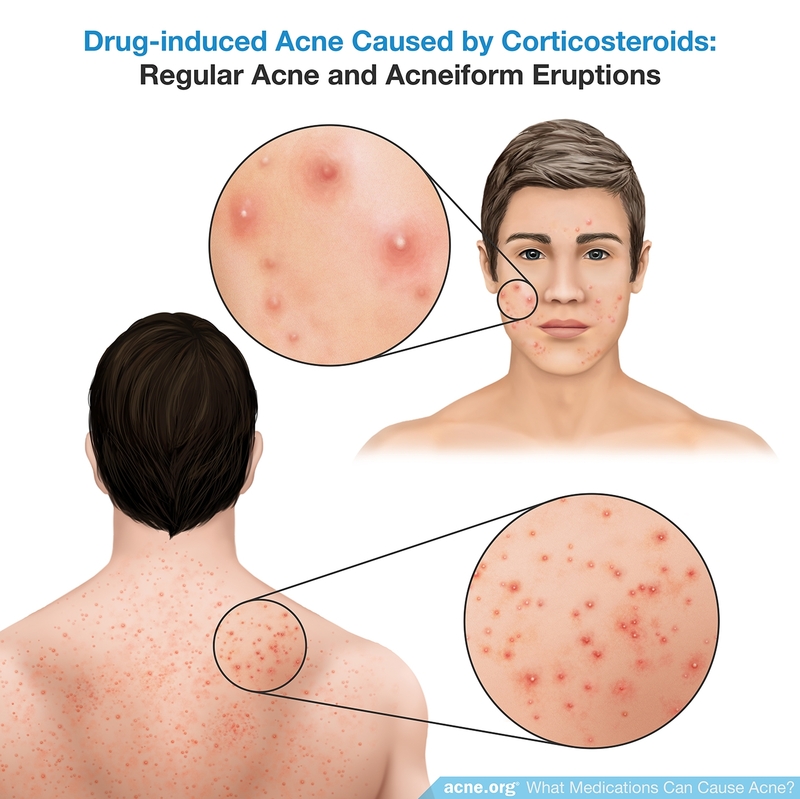 Several common medications might cause acne, based on a small number of case reports. 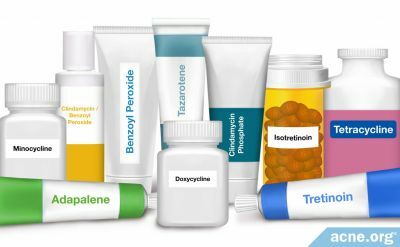 Because there is little research evidence linking these medications to acne, we do not know how they potentially cause acne or how the acne should be treated. 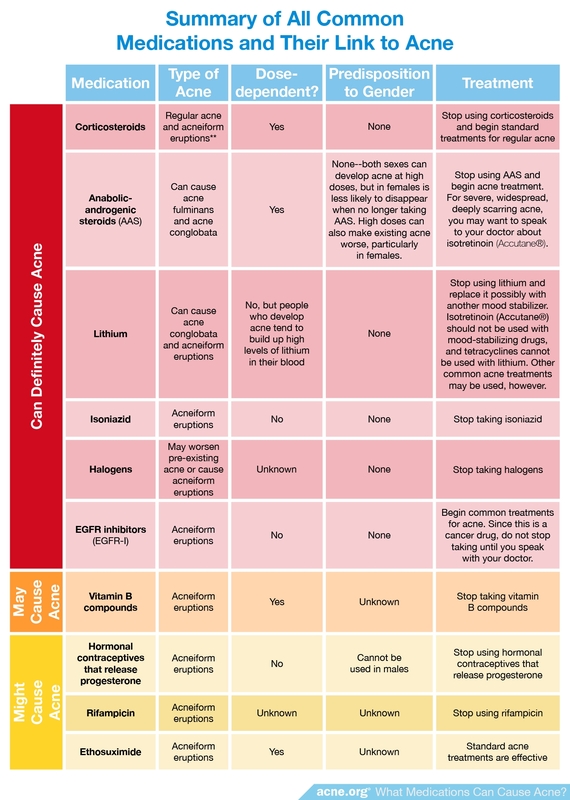 The table below summarizes all the common medications we have looked at and their link with acne. 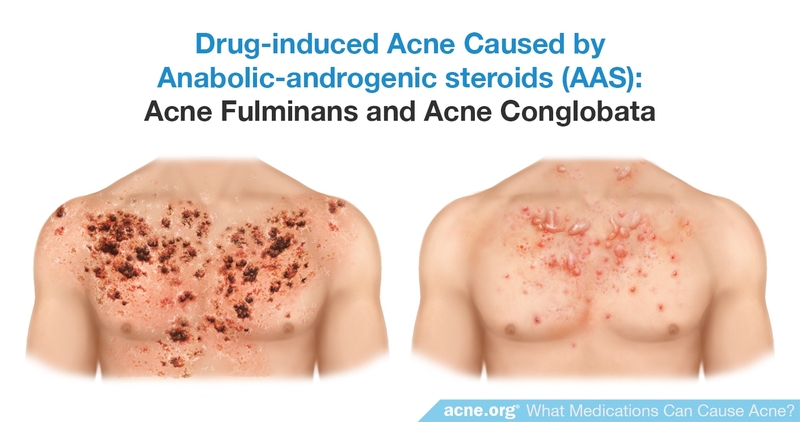 Research shows that common medications, such as corticosteroids, anabolic-androgenic steroids (AAS), lithium, isoniazid, halogens, and EGFR inhibitors (EGFR-I), definitely can cause acne. Though the evidence is scanty, the same may be true of vitamin B supplements. 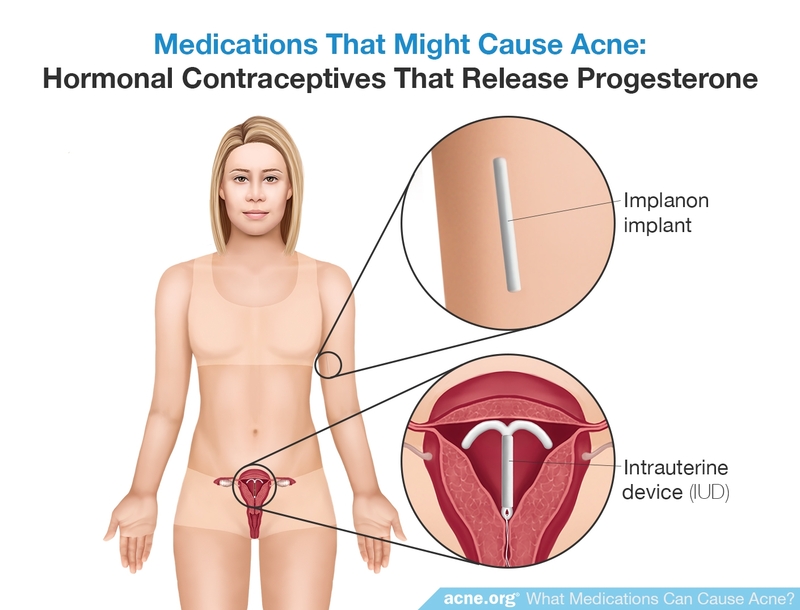 Lastly, some case reports suggest that rifampicin, ethosuximide, and other hormonal contraceptives which release progesterone potentially bring about acne. Kazandjieva, J. & Tsankov, N. Drug-induced acne. Clin Dermatol 35, 156–162 (2017). Zouboulis, C. Pathogenesis and Treatment of Acne and Rosacea. (Springer Berlin Heidelberg, 2014). 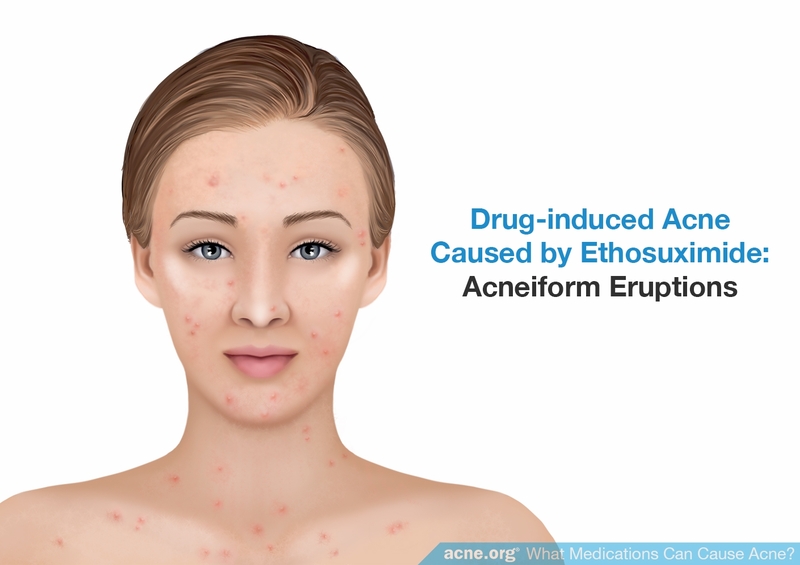 Cutaneous drug eruptions. 157–165 (Springer, 2015). Zeichner, J. Acneiform eruptions in dermatology. (Springer Science+Business Media, 2014). Du-Thanh, A., Kluger, N., Bensalleh, H. & Guillot, B. Drug-Induced Acneiform Eruption. 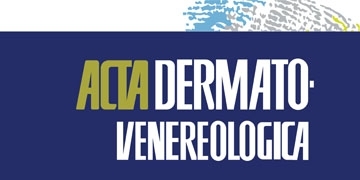 Am J Clin Dermatol 12, 233–245 (2011). Ricci, F., Paradisi, A. & Masini, F. Acneiform eruption induced by ethosuximide. EJD 24, 97–98 (2017). DeWitt, C., Siroy, A. & Stone, S. Acneiform eruptions associated with epidermal growth factor receptor–targeted chemotherapy. 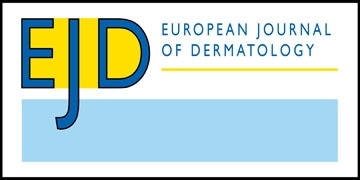 J Am Acad Dermatol 56, 500–505 (2007).